MUNICH, Sporting Alert — Watch video highlight from Fox Soccer, as Real Madrid edged Bayern Munich 2-1 in the first leg of their Champions League quarterfinal game in Germany on Wednesday. 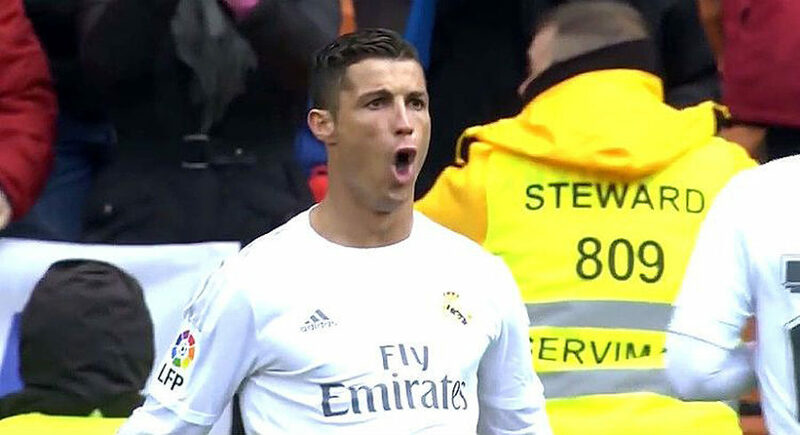 A brace from attacker Cristiano Ronaldo gave the Spanish La Liga leaders the advantage in the two-way tie on the road. Bayern Munich took the lead in the 26th minute when Arturo Vidal hammered home a powerful header into the top of the net from a corner kick. Vidal also squandered the chance to put his team 2-0 up before the break after he missed a controversial penalty kick when he blasted the spot-kick over the crossbar and into the stands. Ronaldo and Real Madrid made sure the home side paid. The Portugal forward first guided home a cross past Manuel Neuer in the 47th minute to even up the scores at 1-1 before sealing the win later. With 13-minutes left in the game, Ronaldo stabbed the ball past Neuer to take his tally to 100 European goals and left Bayern Munich on the verge of elimination. “We showed the willingness to get a good result after the first half and if we had gone in at 2-0, it may have been a different match,” said Real Madrid coach Zinedine Zidane. Zidane, though, dismissed suggestions that the tie, which now heads to Madrid, is already over. The German champions also played the final 30 minutes of the game with 10-man after midfielder Javi Martinez picked up two quick yellow cards and was sent off. Meanwhile, Bayern Munich played the game without leading scorer Robert Lewandowsi, as the Poland forward did not recover from the shoulder injury he suffered over the weekend. German attacker Thomas Muller was asked to lead the forward line by manager Carlo Ancelotti. Despite the defeat, Ancelotti remains positive ahead of the return trip to the Bernabeu next week. “We had no luck tonight and it was the small details which made the difference,” the Italian said. Ancelotti continued: “It will be more difficult in Madrid, but we still have a chance, we are still alive. Two other Champions League quarterfinal games were played on the day. Spanish side Atlético Madrid edged out English Premier League champions Leicester City 1-0, while Monaco also beat Borussia Dortmund by the odd goal, following the French side’s 3-2 victory in their rescheduled encounter. The matchup between Monaco and Borussia Dortmund was initially scheduled for Tuesday, but was forced to rescheduled following a security incident on Tuesday, which saw the German side’s team bus attacked and one player left seriously injured.